Charles Colcock Jones, 1804-1863 The Religious Instruction of the Negroes in the United States. 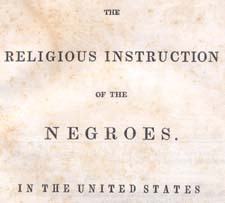 The Religious Instruction of the Negroes in the United States. Savannah: Published by Thomas Purse, 1842. African Americans -- Missions -- History. Christian education -- United States -- History. Church and education -- United States -- History.